Plot Summary: Fielding Pierce lives the life of an aspiring politician - in 1972 he's serving in the Coast Guard (trying to avoid Vietnam in the most honorable way), and by 1973 he has entered law school. Along the way he falls in love with Sarah, a fiercely idealistic woman who devotes her life to helping others - unfortunately she's killed in an explosion while assisting members of the Chilean resistance. Nine years later, in the middle of a congressional election, Fielding is suddenly flooded with thoughts and visions of his lost love. Review: There are a very few a times you wonder that is it necessary to pull up your magnifying glass and gloss through a movie looking for a mole. Can it be possible to not look at the transition point, the bald expression in an actor's face, a loose end in the screenplay and inept editing to spill the beans or yes a director's obsession with only a few characters and other characters looks faded with no space in the script? Sometimes you just don't want to raise them in a film review, because, while going through the course of the movie, it manages to stir such emotions within in and moves you to tears that you stop looking in the craft that might have gone wrong and still it is balancing on the emotional quotient that has captured your attention. 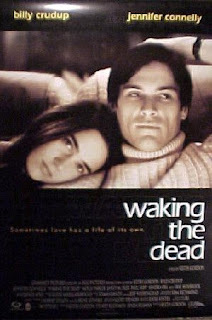 WAKING THE DEAD skips back and forth in the life of Fielding Pierce (Billy Crudup), a young Coast Guard officer who yearns for political office. In 1972 New York, he falls hard for Sarah Williams (Jennifer Connelly), whose leftist activism clashes with his driven image making. The pair become passionate, quarrel, split apart and reunites repeatedly over the next two years, as Fielding’s star rises and Sarah’s quest for social justice becomes more specific and dangerous. The film uses the most often used transition method to flip back to history, the frame washes down to pure white and takes you 9 years back in Fielding's life. But soon, you stop noticing it as Billy gives a great performance where he definitely looks a different person during the time he was with Sarah played beautifully by Jennifer Connelly, her performance reminds me of Rachel Weitz in her role in "The Constant Gardener". But the chemistry that Fielding and Sarah build between each other will touch you in a strange way. There are many a times when two people know that they are made for each other and still wonder if their inner beliefs will act as a barrier for a peaceful life ahead. "Soul mate" is word that is often used when we go back into nostalgia in Fielding and Sarah's relationship, and their performance just reinforces it, although we see in them brief interlude and most often their engagement is not always resolving. During the last days of Fielding campaign where he builds up a phantom or a supernatural spirit conjured by Fielding’s fervent need for closure? The films places you in Fielding place and for a moment for the great soul mates that they seem to be, you start believing in his false visions. The only thing in the film which didn't work for me is the character of Molly Parker who seems to be as fine as a brittle trophy girlfriend; her character is flatly conceived and badly executed. Rest will just breeze you through, an amazing film which talks about relationship like I have seen very few a film managing to portray yet. Jennifer Connelly is brilliant and though her screen time seems to be fairly less, you will not realize that, and constantly yearn for her to appear again.